Andrea Wilkie, chairwoman of Barnt Green Choral Society, extols the benefits of singing together. ‘Help protect us’ sang choir as rain fell . . . this was the headline in the Bromsgrove Messenger on May 13, 1977 above a review of Barnt Green Choral Society’s Jubilee concert in the Margesson Sports Hall, Barnt Green. They were performing Haydn’s The Seasons, accompanied by an incessant drumming on the tin roof of a torrential summer downpour, which rose to a mighty crescendo as they sang the lines Hark the tempest nearer comes! Heaven help us! Yet even this was preferable to their 1973 Christmas Messiah in Rubery’s St Chad’s church: the three-day week had paralysed the heating system and singers and orchestra were obliged to perform in their overcoats – apparently the audience retrieved their car rugs during the interval to aid survival. Despite these events, BGCS has thrived for the intervening 30 years, although it has been in existence since 1951. 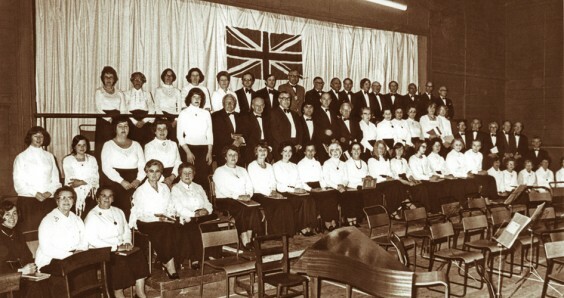 The Barnt Green Women’s Institute singers – realising the limitations of a female voice choir – had opened their ranks to gentlemen members, and called themselves the Barnt Green Choir. Then on Monday October 15, 1951 the 34 members of the newly-named Barnt Green Choral Society had their first rehearsal in the old Parish Rooms behind St Andrew’s Church under the baton of Leslie Armstrong-Smith, who remained in charge for the next eight years. He was succeeded by Geoffrey Gibbons until 1961, when Cyril Horne began his 36-year reign as musical director. It was Cyril who was doing battle with the elements on that rainy June evening. Work by Heart Research UK confirms its therapeutic value. “We are convinced that it is a power tool. Research we’ve just done involving over 12,000 people identified several particular benefits of regular group singing, specifically individuals who say it helped them to recover from strokes or heart attacks,” says Prof Grenville Hancox, director of music at Canterbury Christ Church University. In Frankfurt he found that after performing Mozart’s Requiem, singers had higher levels of immunoglobulin A (which gives resistance to bacteria) than before. The Government’s recent £40 million funding of the Sing Up campaign in primary schools is already proving that when children sing together they are happier, work better and achieve more. And for adults of whatever age, it is acknowledged that singing exercises the brain and memory, links left and right brain function, engages the emotions and encourages a feeling of belonging. But for indisputable proof of the long-term benefits of singing, we need look no further than two of our octogenarians, Betty Lucas (front row, ninth from left) and Harold Crisp (second row, fourth from right). Betty has been a member for 40 years, and has only ever missed a rehearsal if she’s had a cold. She says: “I’ve really enjoyed the wide range of music we’ve sung over the years, from Handel’s Messiah to Jenkins’ The Armed Man. “When we first moved here from King’s Heath, I had been a member of the University Operatic Society, and wasn’t too sure about a choral society. But I went to their concert in St Andrew’s Church and thought they were surprisingly good, so I joined up. Harold, now 85, lives in Black­well. He started singing as a boy. “I was told it would help with my stammer, and I did find it really made a difference,” he says. All these stalwarts, alongside the other enthusiastic members of the society, will be in good voice for their next event – the spring concert, on Saturday March 29 in St Andrew’s Church, Sandhills Road. They will sing Dvorak’s Te Deum and extracts for Easter from Handel’s Messiah. One person who won’t have far to travel on this occasion in St Andrew’s Church is the soprano soloist Sheila Davies, who has lived in Barnt Green for 20 years, and who has sung with the choir on several occasions. She is a regular soloist with Worcester Cathedral Chamber Choir, and is a founder member of the Worcester-based close harmony group Chapter 8, of which Ian Bell, the bass soloist for this event, is also a member. Keep an eye out for them this summer performing The Journey – a mixture of music and readings based on travel – which is planned for various Worcestershire venues later in the year. The Society welcomes all new members – it is a non-audition choir and lack of experience or confidence is no reason not to come along and try out the beneficial effects of singing. Rehearsals are at 7.45pm every Monday at the Parish Rooms. For further details ring the chair Andrea Wilkie on 0121 445 3710 or secretary Fiona Brown on 0121 445 5513.